Heat, sun, and a light 5-9 knot southeasterly breeze allowed for seven exciting races to open the 2014 International Moth Line Honors US National Championship in Key Largo, Florida today, with US Virgin Island native and Newport, RI resident Anthony Kotoun taking a 10 point lead over second place to the beach. The wily pro sailing veteran and multiple class World Champion smiled when asked his secret to the big lead, which included three race wins in a star-studded fleet: “I’m just lucky.” Kotoun wasn’t lucky on his way in from the course, breaking one of the lightweight carbon fibre wing bars on his Moth. In true Moth Class style, his competitors quickly worked to repair the damage while Kotoun rushed off to a wedding. “I missed this kind of camaraderie,” said Dalton Bergan, lying just a point out of second place despite having not sailed a Moth since the Hawaii Worlds last year. “I chartered the Class President’s boat and brought down a new sail, and I’m pretty happy with how it’s going so far." Bergan and some of the other veterans were happy to head straight to their hotel room after racing concluded around 3pm, while more than a dozen Moth sailors hung around the beach and the friendly UKSC bar, until a gentle 10 knot breeze came in at sunset. Shouts of “Let’s go!” rang out amongst the racers, and a half-dozen foiled downwind toward the setting sun for a ‘sundowner’. 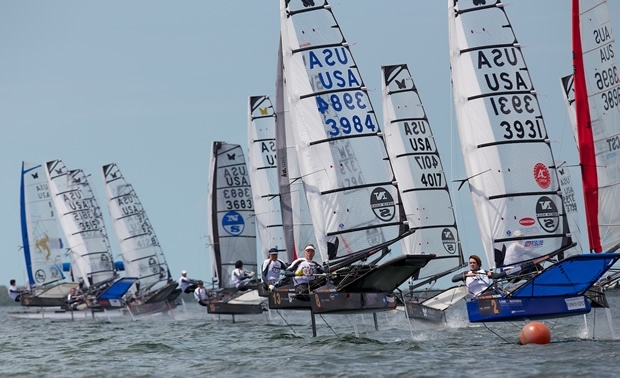 US Sailing Team member Brad Funk clung to a 1-point lead over Bergan, with the Miami sailor winning one race today by minutes after foiling away from the fleet at one start. “Sometimes the fleet doesn’t recognize the lull before a race, and if you can get up on your foils and just stay there right into the start, you can make huge gains,” he said. The light air in half of today’s races required a rare technique called the “gack” – a gybe on an upwind leg to stay on the foils - from many sailors, and Detroit’s George Peet said he used it to good effect: “It was just past where I thought I could stick the foiling tack, so gacking was the way to go for me despite the extra distance.” Peet sits just two points behind Bergan, and three ahead of his Detroit training partner, double world champ Bora Gulari. Forecasts continue to show uncertainty in the breeze for tomorrow’s finale.